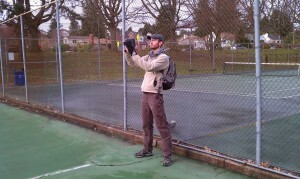 Rain and Mobile Databases in Seattle | Digital Archaeologist for Hire. 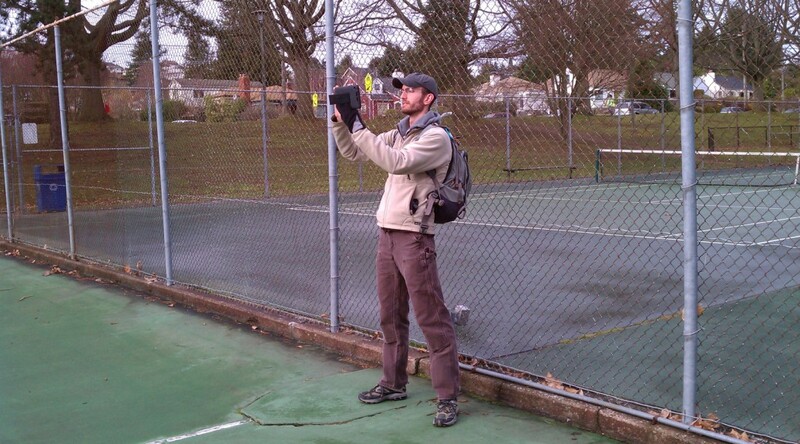 As one of my projects when I’m not watching my son, I work as part of a team of archaeologists who monitor a large construction project here in Seattle. Our job is to document any historic or prehistoric finds the construction crews uncover and, if the finds are significant, halt construction so that we can a) carefully excavate and record the find or b) work with the project managers to modify the construction project to avoid damaging the archaeological resource. While working on the monitoring project, I’ve experimented with a few new documentation techniques. So far, I’ve compared taking notes and photographs with database apps on both an iPad Mini and a Nexus 7 Android tablet with the more typical method of using a Write-the-Rain field notebook and a digital camera. Although I’ve written in the past about using FileMaker Pro to create mobile databases, I wanted to experiment with two less expensive database apps: TapForms (iOS) and MementoDB (Android). A quick demonstration record in TapForms. A quick demonstration record in MementoDB. 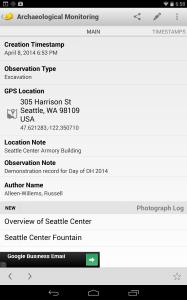 I’m working on more detailed reviews of the apps but, for now, the brief version is that both apps work well for creating mobile data collection forms and support relationships between records to minimize data entry (e.g. you can link many separate photograph records back to one site or observation record). 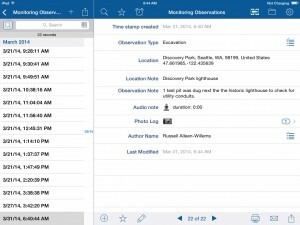 Both apps also support using a device’s internal GPS and/or network connection to retrieve rough locations, and allow you to attach photographs, drawings, and other files to database records. Both apps export records as CSV files and have several different options for transferring files off a device. On that note, one notable TapForms feature includes a small web and FTP server that allows you to access exported files over a network rather than having to connect to the iOS device through iTunes. Memento, on the other hand, includes support for syncing database tables with Google Documents spreadsheets. 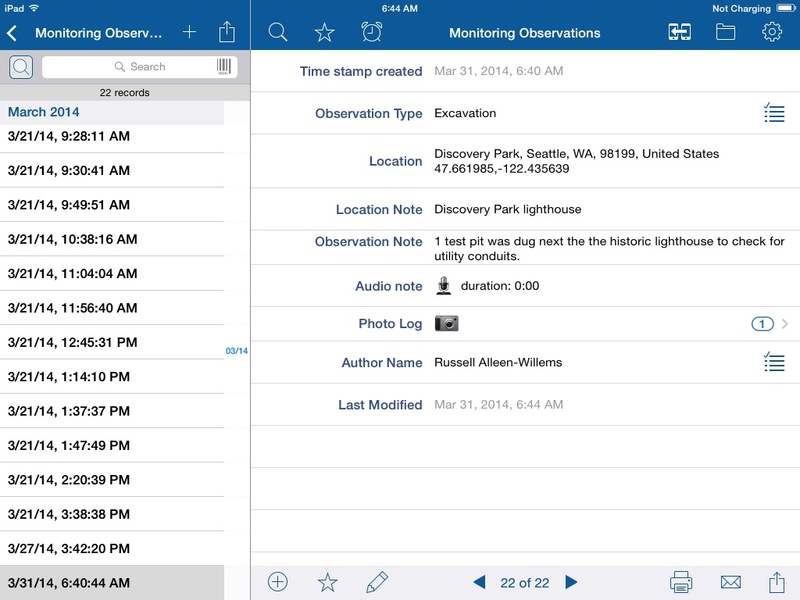 Either of these apps can be good solutions for archaeologists looking to create digital note taking solutions for themselves, but neither of these apps includes support for having multiple users access and change records at the same time. In particular, I wish Memento had better support for creating unique IDs and calculated values that included text. This morning, I took the records I created on both TapForms and MementoDB and combined them into one database using FileMaker Pro 13. I had to do some cleaning to standardize the data as each app records GPS locations using a slightly different format and they both have some peculiarities in how they export the foreign keys used to relate two records together. After integrating the two datasets, I mapped the relationship between my two main tables -photographs and observations- and created a FileMaker layout that displays each observation with all its related photographs. I copied over that information to Microsoft Word and cleaned up the photograph descriptions and preface text to finish my report. Recording on a tablet allowed me to write much of my report text while still in the field and saved a lot of time over writing my report by typing up the notes from my field notebook and manually matching my photographs to their descriptions in my paper photo log. In addition to speed, another improvement is that each of the records has a specific geographic coordinate. Often, I had to move back and forth between several different locations while monitoring and taking notes on the various tablets. It was really handy to be able to quickly see which records were related by location, even if I took the notes over the course of several hours or days. Archaeologists have experimented with digital recording for many years, but the introduction of small, lightweight and relatively inexpensive mobile devices, in my opinion, means digital recording is likely going to become the standard for archaeological recording. 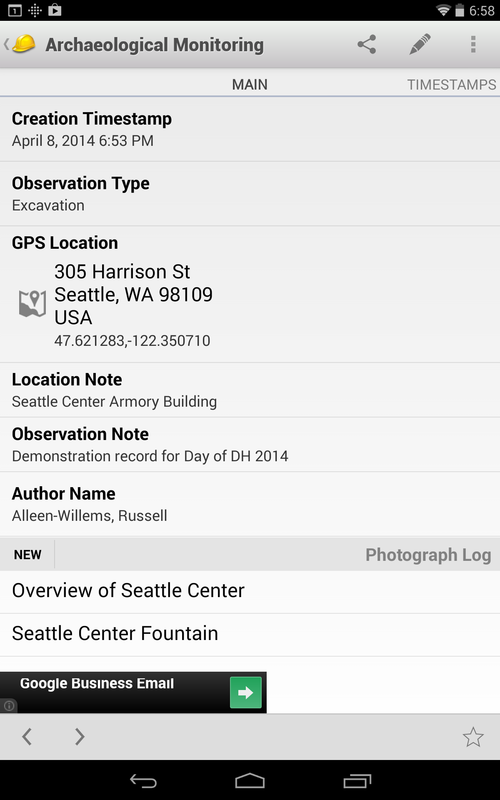 There are a number of mobile applications specially designed for archaeology, but archaeologists can also use general database apps like TapForms and MementoDB to quickly experiment with digital recording on whatever devices they have available. For the rest of Day of DH 2014, I spent most of my time running errands with my little guy, meeting his mom for lunch, dropping off our car for some maintenance, and dodging the rain to hang out at Seattle Center to write up this post and read about everyone else’s Day of DH!